Q: We have not been in touch since long time. How is your health? And how do you pass your time? Ans: Last time I was in People’s Review interviewed by you nearly two year ago then too I was not well. I landed in a wrong place for operation. Two operations at a time made me horribly weak. No good surgeon would do such a work. I have many health problems and they are not curable until I go to a noted hospital of the most advance country. But here in our country, every occupation and business is controlled by mafias. The medical field is not out of it. A noted surgeon or physician works in many hospitals and spend more time on these private hospitals rather than devoting time in the mother institution where they should work at least 8 hours and attend emergency patients. I too was a victim of these medical groups who just wanted to make money. These private hospitals charge 5 times more than the government and universities hospitals. To put in a nut shell no section of our society is corruption free and are dedicated to the people and their cause. This is the reason young generation Nepalese finds no future in this country and go far away to live with dignity and honour plus a better life with good amount of earning. The worst of our society is that most of the youths are having some mental disorder. They are jobless, frustrated, depressed and are suffering from many mental problems. Psychiatrist assume that more than 80% of the youths are of mental disorder. If you ask about my health even my family members are tired of me. I am sick and bed ridden. I don’t know for how many days I have to go like this. Anyway, I wish my chapter should be closed at the earliest. Q. How do you find Nepal’s position in this great game? Ans: Of course we are not great player as we were in 16 century or were during 6,7 century and even in 18 century. We are being the victim of foreign aggression and the world is controlled by powerful nations who give much value to those countries which can stand on its own with wealth and power. But you know this world has hardly been in the side of weak and poor countries. Even those nations who suffered for centuries under the occupation of several imperialist powers and made their people slave have not shied away to be in the side of the expansionist powers. Take Nepal’s case. Nepal was tricked to cede half of its territory the Britain to end the British – Nepal war. This British occupied territory of Nepal was again transferred to India. The British did it because they never wanted Nepal to rise as they after the 1816 Anglo Nepal war has realised that if Nepal is not further weakened it will take avenge with Britain. This feeling always haunts Britain. To recall Brain Hodgson British resident in Kathmandu in 1933 wrote to his British government “Nepal is biding time to avenge its defeat in the last war.” I firmly believe this India too is afraid of Nepal’s hidden strength and the fighting capability of its people whom the British named as Gurkhas. The realization of this fact was expressed in a different vein during Narendra Modi’s first visit to Nepal as Prime Minister when he said “every Indian victory over Pakistan could be achieved by the contribution of the Nepalese (Gurkhas).” And he also stressed on Nepal’s ability to provide light to dark India. Well Modi has changed now. He has entered into Nehru era and adopted the policy of Britain and its blue eyed boy Jawahar Lal Nehru’s aggressive foreign policy and expansionist design. For us we are fighting the battle for survival and it too is not being allowed. In such situation Nepalese will have to understand the threat, our eroding sovereignty and the true nature of the great powers. But the tragedy is that we have not realized the humiliation. And if we don’t rise and reinvented ourselves as a nation whose people are ready to fight to the last citizen to guard the sovereignty and demonstrate this ability to our enemy Nepal face the real prospect of political extinction of being a “wangguo” (lost country) which Liang Qichao termed the then Chinese condition when its major parts was under the occupation of Western imperialism powers and notoriously criminalized militarist Japan. Q. what is your opinion about the local level election? Ans: It was something like a blessing for the common Nepalese and their so called politicians. Local election after 20 years. These politicians must be ashamed of themselves and we people couldn’t revolt against them to become new citizens for a new Nepal. I personally am not opposed to such exercise that helps arouse people’s consciousness. However, I don’t believe that this is a great event which will bring revolutionary change in our countries semi colonized position, servile mind set of the governance and the slavish mentality of the common people. Ans: No. it does not go with my mind and my thinking. Now I am in advance age. You may laugh at me if I say I prefer to join the war of liberation with a khukuri in my hand than to be in the lousy long queue holding a voters ID card for hours to choose someone who can hardly think of the humiliated position of the nation and life of a foreign slave fighting for the cause of the imperialist. Well, I don’t belong to these groups of politicians. 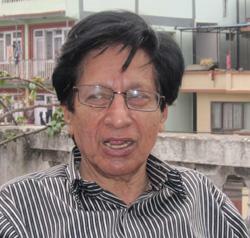 I am an ordinary citizen with no political ambition but being an old man i think of Bhakti Thapa(at 74), the brave among the bravest, with his 400 soldiers charging on the British column equipped with heavy machine guns, hidden six pounder batteries and cannons in “the battle of Deonthal” with sword and Khukurin in hands and sacrificing his life for the mother land Nepal. I just want to raise a question here did we ever loose to Britain? I would say no. and the British too knows it. Nepal’s so called defeat in Anglo Nepal war was an act of deceit, trick and treachery of Britain. Otherwise Nepal would have defeated all their commands and compelled their commanders to flee to their occupied colonies to South Asia. You know why I always try to remind our people about our glorious history, our valour and modesty. You know these coward rulers have made the people not only the slaves of Indian imperialist and also of other countries but a bit indirectly. I never trust in ballot for a country like Nepal which is virtually under the occupation of foreign power and whose sovereignty, independence and territorial integrity is being steadily smashed. Balloting in one way is also the continuity of our dishonour and slavery. I don’t know if liberty and slavery can go at the same time as in our country to make it clear the day millions of Nepalese were voting in the name of so called democracy and protection of constitution thousands of youths were either leaving the country to find the job abroad and thousands others were being recruited in their army by the imperial army in the same soil where in the name of democracy people were being encouraged. This is all going against the back drop of our prime need of our national liberation and our rule in our own country. Yesterday a DPM of this country was telling loudly that “it is likely that Nepal’s economy is going to be in the hands of foreign power.” Well he didn’t say anything new. This poor fellow couldn’t say how his government was formed and how his boss arms was twisted and they had to topple the government of which they themselves were a part at the order of Delhi even if they knew that the government was a bit better than the previous ones in the term of maintaining the national identity and independent foreign policy. Delhi didn’t want President XI to visit Nepal and help Nepal to pave way for a bright future investing hugely to build infrastructure, hydropower projects and promote tourism, help build the historical sights destroyed by the great earthquake and other areas. Cancellation of president XI’s visit to Nepal was one of the sad for Nepal. Q. How the online and Medias are manipulating? Ans: Though my version were very much misrepresented or overplayed by media I still believe that the previous government should have continued for the stability and prosperity of the country. I never said that the government will be able to liberate the people from the yolk of imperialism but I believe that they were at least doing something which is quintessential and necessary for our identity. Well you can read yourself how a section of the people having some sense of national consciousness voted largely in favour of UML to reward it for trying to break the strangle hold of India and get a passage to the sea from the North. Q. How is China Study Centre doing now? Ans: I am ashamed to say that I am still the chairman of this CSC. I do nothing much there but some of my colleagues who were nominated by me often comes to me for consultation whenever they have some problems among themselves. These days I feel unhappy for being there for such a long time. I have become life ling president till today. CSC was formed in 1999 with a meagre logistic and financial support which we collected by ourselves. We opened several chapters of different part of countries from South to North. Then Delhi came heavily on us, particularly me CSC was projected as Chinese spy organization in the so called free Indian medias and I was targeted. They were particularly unhappy because we support the Chinese policy and published book to bring people of two countries closer. Basically we were publishing truth and only truth and it’s not that we didn’t Criticise China-Nepal policy which I often wrote as very weak and confusing. We opposed various Chinese policies in South Asia including its policy on Sikkim as a sovereign and independent state and even about our territories under Indian occupation and recruitment of our people by the imperialist powers. There is a long story about it. From 1991 to 2014 I frequently visited to China leading CSC delegation and had interaction with Chinese authorities and powerful NGO’s. Our policy is to maintain best relation with China but that doesn’t mean that we accept each and every decision taken by them. Helping expansionist power and accepting the British drawn border line will never be acceptable for us. If I live and improve my health I will definitely write the truth of my experience. However though I differ with China in many issues I will always say that China is our most cordial friendly neighbour and that generally the Chinese are very good people. Q. So when will you give up your live long presidentship of CSC? Ans: yes it is a big joke. I tried to quit CSC long time back as a Chairman and be there as an advisor or you know.Like an ordinary member. But since CSC was under heavy Indian attack and CSC had no resources to maintain even our office and keep some staffs to run the office. Even our founder colleagues wanted to close the office and function from our respective home. I opposed it. I borrowed money from friends together with my colleagues and keep the center moving and functional. I can’t write in detail here how Indian spies were threatening the member of our organizations, particularly in Tarai. Even I was indirectly threatened of life. Those were bad days and still I am facing worst days. Because of my stand against Indian policy and my bid to keep the CSC moving my family member had to suffer a lot. I couldn’t give time to my children and nor could I think about their future or take any advantage. They got education in a very modest school in Nepal. They didn’t have chance to go abroad for higher education. I have very bitter experience regarding it. Especially the outsider has managed to use my own colleagues against me. Worst conspiracy was being hatched even when I was sick and almost bed ridden. I was miss lead and miss informed about foreign visitors. They will inform me that a sinologist from a country hostile to China wants to meet me and other colleagues in CSC. I was there but to my surprise these sinologist were accompanied by the envoy of the country which I never knew and expected in our office. These episodes as I ponder after sometime now I could know that it was a conspiracy to project me as a person favourable to that particular country which is very hostile to China and had perpetrated heinous crime on the Chinese people. Q. What do you think about Nepal joining the OBOR initiative? Ans: It was a right thing but they took a very long time. You can understand their hurdles. Nepal should have been in the OBOR long time back. This is a great thought and initiative. No wise country would like to be left out of it because President Xi’s brainchild Belt and Road initiative is a collective exercise to connect and integrate the entire world and for everybody by everyone as after signing MoU on the framework agreement on China’s OBOR initiative with Nepal in Kathmandu the Chinese ambassador to Nepal Yu Hong rightly said “the initiative is not going to be China’s solo show. A better analogy would be that of a symphony performed by an orchestra composed of all participating countries.” I think we will talk more on B&R and try to learn more about it.